A new litter of Squaredy Cats has recently been created, with another due on shelves in springtime, too. Created by Park Slope designers Kurt Marquart and Elaine de la Mata, the first 8 cat toys were introduced to Toys R Us and similar stores last season. They were very popular, and so a new batch was ordered for the fall, consisting of four of the original cats, and four new models. 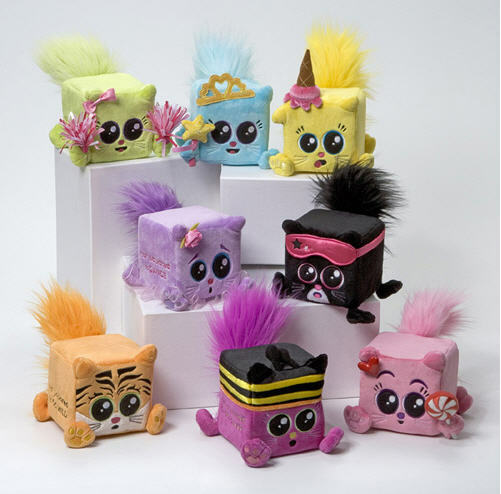 Manufactured by Gund, these Squaredy Cats are created for young and pre-teen girls. The cats are created and designed by the couple in their studio in Gowanus. Now, the couple hopes to expand their business, and is in talks with distributors around the world. “We’re very hopeful that by the end of this year we’ll have Squaredy Cats also available in the UK, Australia and several countries in Europe and Asia” Marquart said.